The Thinking Fan’s Guide to Walt Disney World is a guidebook for those who want to take a deeper look into the history and creation of the lands and attractions at the Magic Kingdom park in Walt Disney World. The author, Aaron Wallace, takes you on a journey clockwise throughout the park, beginning in Adventureland and culminating on Main Street U.S.A. As you enter each land, you are provided with a description and history of the area and then guided through each attraction in that land. The highlight of the book for me, as a big Disney fan, was learning about Walt’s influence on the attractions as they were created for Disneyland and later re-created for the Magic Kingdom. Aaron Wallace did a great job researching and providing his readers with both historical and current information about each attraction. He gives a quick introduction about the attraction and then goes into great detail. He is truthful in his opinions, but also provides insight on why some of the lesser visited attractions still exist and how they are connected back to Walt Disney himself. Mr. Wallace also ties in a movie to each attraction. Overall, I think it was a great book for Disney fans, like me, to dig deeper into the history of the Magic Kingdom. In my honest opinion, I wouldn’t want to read the book before visiting for the first time since the author goes into great detail about each attraction (and I like surprises). I would however, bring it along with me so after I experience an attraction, I can read up on details I may have overlooked. 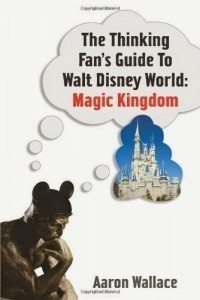 **WDW hints note: Keep in mind as you read this book that Magic Kingdom is constantly growing and changing, so as you read this book, you will notice that some things have already changed since the book was published. For example, there are no longer paper fastpasses in this park and some of the newest attractions (Enchanted Tales with Belle, Journey of the Little Mermaid and Seven Dwarfs Mine Train) are not included. I hope that we will see an update for this book soon as well as follow-up guides for Epcot, Hollywood Studios and Animal Kingdom. Disclaimer: We received a complimentary copy of The Thinking Fan’s Guide to Walt Disney World: Magic Kingdom in exchange for an honest review. All opinions are our own. Affiliate links have been provided but do not raise the cost of the book for buyers.